I know a lot of people who aren’t comfortable with towing a trailer. My wife is among them. I have stopped trying to convince them that they can tow, because I’m not sure if everyone really can. Towing successfully takes a certain amount of skill, confidence, and perhaps natural ability. Just as it is true that not everyone can drive a race car well, I think it may be true that not everyone is cut out to pull a trailer. For me it has been an enjoyable challenge to learn the skills. I actually like piloting my big trailer around, and things like backing up and maneuvering on narrow roads are sort of fun, most of the time. So I was amused to see Forbes Magazine publish a list of “America’s Scariest Drives.” There are eleven listed. In my opinion, several of them aren’t particularly scary except perhaps in the mind of a travel writer. Not only have we driven many of them, we’ve towed our 30-foot Airstream down three of them (I-15 in Los Angeles, Rt 50 in Nevada, and coastal Rt 1 in California), and didn’t find the experiences particularly frightening. Let me tell you, there are much scarier roads if you are towing a trailer. Most of them are in Colorado, where steep mountain passes are almost unavoidable. Imagine a 8% grade winding up to 10,000 feet for miles, while the thin air robs your engine of power and the temperature gauges on your transmission and engine slowly creep up toward the redline. This is usually followed by a similar descent, shock-cooling the engine while the brakes heat up and begin to fade. We’ve done several of these roads in Colorado, including the notorious Slumgullion Pass on Rt 149, but by far the worst one (psychologically) was Rt 550 between Durango and Silverton. It includes three tough passes and miles of twisting roads atop terrifying precipices. You can’t help but think, “One slip and we’re going to fall a thousand feet.” Often, there’s no guardrail. We did it in the fog and a light rain, too. Steeper than those is the Teton Pass between Jackson Hole WY and Victor ID. It runs at 10% grade for five miles up and five miles down. Climbing this hill with the trailer on a warm day was the only time we ever managed to overheat our engine, in three years of full-time towing. On the way down, you’d better have good trailer brakes. For sheer heat, however, nothing beats Rt 190 from Death Valley to Owens Lake in the summer. We drove it in late May once, and we were lucky that it was a slightly cooler-than-average day. The road climbs 5000 feet, and ambient temperatures can easily exceed 110 degrees. No matter how tough you think your turbodiesel truck is, this is a road to respect in the summertime. Traffic terror is mostly found in the northeast. Sure, I-15 in Los Angeles can be hairy, but it’s got nothing on I-95 in southern Connecticut during rush hour. Imagine fifty miles of S-curving highway crammed with maniac commuters, riddled with potholes and steel plates, rife with exits and entrances, and about as smooth as a New York-style pizza. You can’t go slower than traffic no matter how bad the road conditions, so expect to find things askew inside the trailer later, and keep your foot ready for a panic stop at all times. Frankly, compared to any of those experiences, I would look forward to a quiet uncrowded drive on Rt 50 in Nevada. It’s a pleasure by comparison, and (honestly) it’s not nearly as lonely as the tourism folks would have you think. And coastal Route 1 in California? Gorgeous and worth the effort. I think I’m going to save the Forbes article for future trip planning. Some of those “scary” roads look pretty interesting. We bypassed the Moki Dugway on our September trip through Indian Country, but I’d like to give it a try. What some people regard as scary might just be the highlight of the drive. It seems that I spend too much time lately writing obituaries for good friends who have left too soon. Yesterday I got the bad news about Vince Saltaformaggio. He died suddenly of a heart attack early Tuesday morning. Most people reading this blog won’t know Vince, but anyone who has encountered him for just a minute will never forget him. He was the big guy with the big smile and the New Orleans accent, trying to feed anyone who walked within 50 feet of his Airstream motorhome. He was always there, the organizer of parties and rallies, the leader of festivities, and the Head Chef at all times. 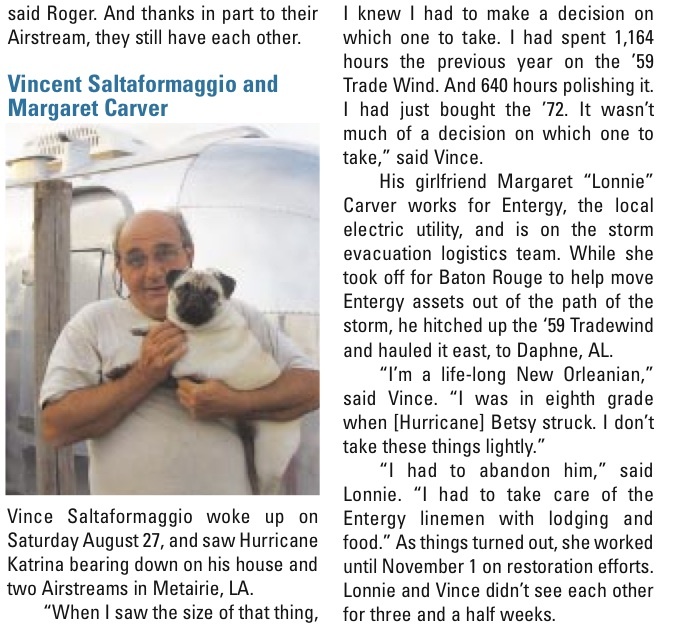 I first met Vince and his longtime companion Lonnie Carver when I was working on an article for the Spring 2006 issue of Airstream Life (see excerpt). I was looking for people who had escaped Hurricane Katrina in their Airstreams, and they had a doozy of a story to tell. 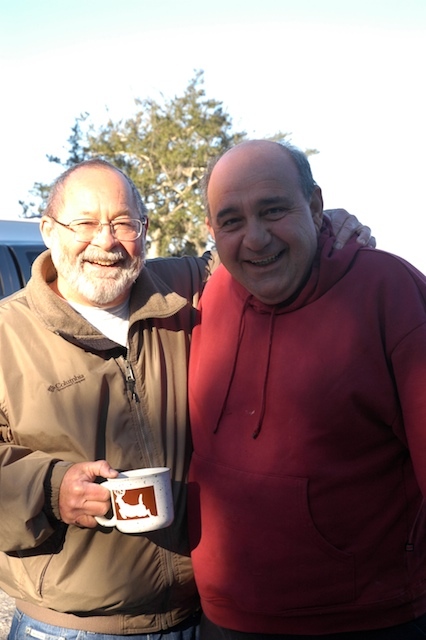 Vince suffered the loss of his home, and after the hurricane, he and Lonnie moved into an Airstream Class A motorhome on the Irish Bayou near New Orleans, and lived there ever since. 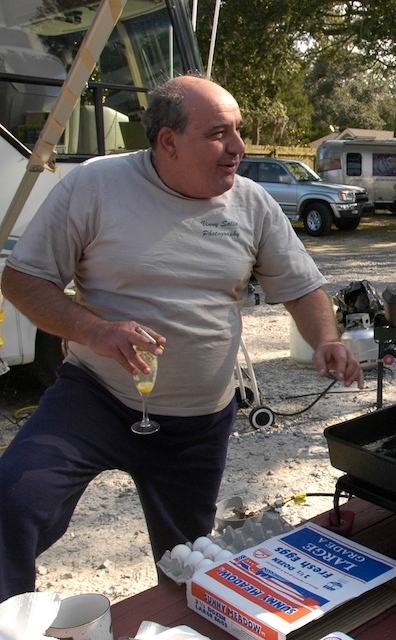 At one point I described Vince as “the quintessential New Orleanian,” for his jovial attitude toward life, his ability to make friends almost instantly, and his amazing talent for cooking. He liked that, and it stuck. Almost every time I saw him after that, he reminded me of the moniker I’d given him — and then he offered me something to eat. At every rally, Vince and Lonnie were the center of the party. There’d be a giant cast-iron double burner running day and night, heavy with stew pots and fry pans, and no matter when you came by there would be something terrific to eat. There was usually a glass of something near Vince’s right hand, and his beloved pug dog would be nearby as well. I learned to seek out Vince at every rally, because I knew I’d be welcomed with a giant bear hug and the smile of someone who is genuinely glad to see you. It seems to sell him short by remembering Vince primarily for his cooking, because he was such a generous and amiable person. But his cooking was so wonderful and honest that it was an emblem of his entire personality. Eating Vince’s food was like being invited to Paul Prudhomme’s home kitchen. It was spectacular. Although professionally he was a photographer, I (and doubtless many others) told him he should really start a second career. But he cooked just for fun. Vince knew how to speak to people through his cooking. Every dish was great warm hug, a taste of comfort from The Big Easy, and a reminder that even amidst strife life is worth living. Certainly Vince lived well. 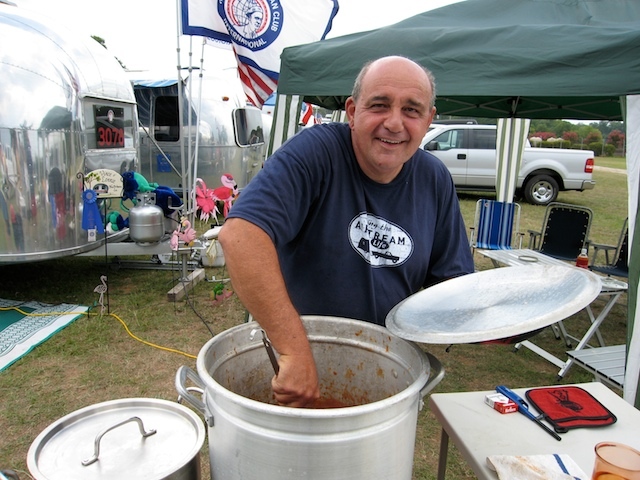 He and Lonnie were on the road often, attending rallies all over the southeast with their massive outdoor kitchen setup. They were always happy when I saw them, just enjoying life and their many friends. Two years ago we met Vince, Lonnie, and a group of their friends who go by the names “Dixie Camperz” in Ft Morgan, AL. They literally spent day and night cooking and feeding the group in what seemed at time to just be one continuous meal. No matter what was going on, there was Vince in the background, sometimes wearing chef’s whites and a coonskin cap, cooking, cooking, cooking. I did something foolish at that event. Despite the incredible meals we were being served, I let slip that I was surprised there hadn’t been any crawfish boil. After all, I reasoned, we’re in the south and that’s a traditional meal — and I hadn’t had it in years. Vince said, “Oh, so you like crawfish eh?” The next day $200 worth of crawfish arrived for a massive boil-up. I was simultaneously flattered and mortified. That was far too much money to spend on my whim, and neither Vince nor Lonnie would accept any contribution to the food budget. But oh, was it good. Emma had her first taste of crawfish there, and that night we were inducted into the Dixie Camperz in a hilarious ceremony featuring nose glasses. I still have the embroidered t-shirt in my collection of momentos from our years on the road. 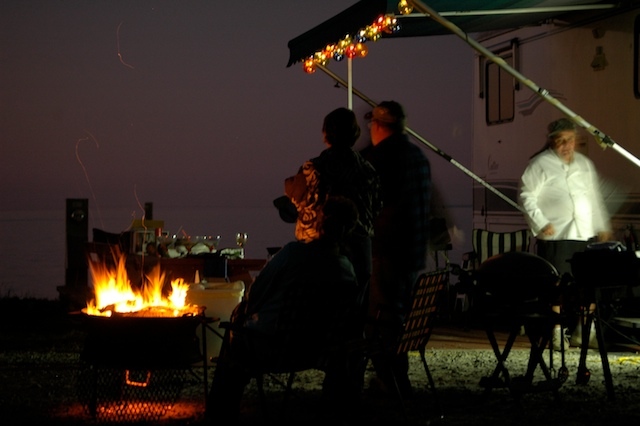 In the Airstream community, Vince is also remembered for his love of vintage trailers. He owned a 1959 Airstream Tradewind that he had lovingly restored and polished. He also owned various other Airstreams, and had started a new restoration project recently. But as much as he polished his ’59, the trailer was always outshined by his extraordinary personality. 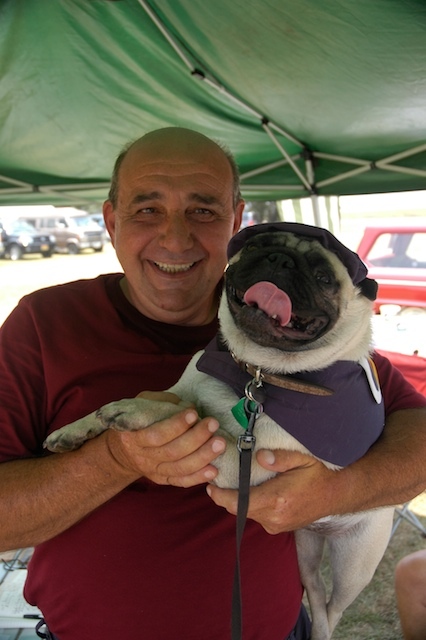 Vince Saltaformaggio was one of those rare ambassadors of Airstreaming who exemplify exactly why we go to rallies, why we travel, why it’s so much fun. We need more guys like him, but they aren’t made every day. To say Vince will be missed is barely enough. This past week has been a quiet one, what with Emma having caught a cold in karate class, and Eleanor staying indoors to avoid Tucson’s spring pollen. (Yes, even in the desert there is pollen, although much less than in other parts of the country.) Without my two companions to go hiking or bicycling, and no friends visiting from out of town, I’ve stayed indoors as well to contemplate future expeditions. With the shift in emphasis away from full-time RV’ing, our options for travel have expanded. I have long wanted to get back into the backpacking mode that we enjoyed before Emma was born. Even though the Airstream is much more comfortable, there is something attractive to me about hiking out into the forest with only the gear one can carry, and pitching a tent in the midst of as much wilderness as modern America can allow. We live in a terrific part of the country for backpacking. Not only is there a virtually year-round climate suitable for it, there are dozens of fascinating national forest sites all over Arizona that can only be reached on foot, or by small vehicle. We have mountain ranges a-plenty, with Native American and Spanish names that evoke mystery and history, like Chiricahua, Sahuarita, Santa Catalina, Dragoon, Tortolita. And despite the influx of spring pollen, this is a superb time of year to go explore them. In the mid-1990s when Eleanor and I were childless and at our backpacking peak, we owned all the gear. Since then, much of it has disappeared, been donated, has worn out, or isn’t suitable for a family of three. We unpacked everything and realized that much of it was not going to make it into the 21st century, in a radically different climate, and in a situation where an 8-year-old was part of the equation. The tent was too small, the mosquito netting wasn’t needed, and the boots — victims of far too many muddy northeastern caves — were beyond hope. We have been slowly acquiring the missing pieces, through sales and bargain-hunting. The collection of gear is now mostly complete, and the next step is to test it in real-world situations. It might seem self-evident that the camping gear is ready for use, but that’s often not the case. Will the lightweight pot balance on the stove without tipping our spaghetti into the dirt? Does everything fit into the backpack? Does the 20-year-old inflatable sleeping pad still hold air? Are the new boots comfortable for 10 miles of hiking with a 40-lb pack? Are we able to carry enough water for desert treks? There are many questions, and the best way to find the answers is to just go ahead and try. Besides, it’s fun to play with the gear. I love the campstove, for example. I’ve had it for about 15 years and it still works great. Tonight I will fire it up on the patio and boil up some dehydrated dinner. We’ll eat with the backpacking plates and utensils, and wash the dishes exactly as we would on a backpacking trip. The test will even extend to doing the dishes exactly as we would on the trail. Once the pollen settles down, the next thing will be to camp out a night in the tent, without Airstream support. Then we’ll go on an actual backpacking trip, probably in one of the nearby mountain ranges. The big goal is to be ready for a Grand Canyon through-hike in September, which will include two nights of camping and about 24 miles of hiking. If we work up to it and test the gear in advance, the big trip will be easy and fun. Plus, we’ll have the 8-year-old ready for it, which is no small consideration. All of this might seem like we are being far too methodical, but you have to remember that half the fun is the preparation. On a quiet week indoors, working up the gear lists, shopping for deals, and testing the toys is a great way to get psyched for the trips yet to come. I am finding that on those days when we do not have friends visiting from far away, I often wonder what to do with myself after a full session in the office. When we were on the road I would simply step outside and explore whatever the local area had to offer, because it was always different and intriguing. But now with the knowledge that we are in the same place we were yesterday, I have to push myself outside. It’s easier done when there is someone visiting. They provide me with that extra motivation. That’s a shame because Tucson really does have an immense amount to offer, if one will just get off one’s posterior and take a look around. On Friday afternoon, Adam and I took a walk down the wash that passes through our neighborhood, following it downstream to wherever it might go. After a few miles of walking and zig-zagging, we’d discovered quite a lot of trail suitable for mountain biking, a massive tree with a treehouse, several large horse properties, a giant pond, several neighborhoods — none of which I even suspected existed. And it was all within walking distance of my house. I have discovered that you really have to walk the washes and the alleyways to see the hidden parts of Tucson. Behind every house in the east side there seems to be a network of dirt alleys, which range from wide-open roads to single-track mountain bike trails overgrown with desert brush. These alleys were constructed to provide access for utilities, but they are also in some cases used as secret driveways to backyard parking. While the streets end frustratingly at every cul-de-sac, making good exploration almost impossible by car, the alleyways run for great distances without regard for development plat or economic stratum. Adam and Susan have taken off for a week to do other things, so I’ve lost my alley hiking buddy for a while. But I am still intrigued at this hidden network of secret passages. A trail bike may be in my immediate future. Suddenly there’s a world of inner space to explore, right from my house, and I want to get to know it as intimately as the cotton-tailed rabbits do. A bike is the ideal vehicle for this program, and springtime in Tucson makes for ideal cycling weather. We had planned to be in west Texas this week, attending a rally and then visiting Big Bend National Park. But circumstances intervened and we decided to cancel the trip to take care of other things. This left us with no travel planned at all, an unconscionable situation. We remedied that a few days ago by planning a trip to southern California for early April. Adam and Susan will be joining us again, along with Ken & Petey. It seems strange that we are going back to the area we just visited in December and early January, but the desert wildflowers are blooming and the weather is much warmer, so there will be things to do that we couldn’t do before. Besides, we never get tired of visiting that particular desert. Our as-yet-unmet blog friends Bethany and Billy are up in northern California (Mendocino) in their Airstream experiencing the damp fog of the redwood coast. They’re blogging that experience quite well, so we have agreed to cover the southern portion of California. Now we just need someone to handle the central portion of the state and we’ll have it all wrapped up, Airstream-blog-wise. In the meantime I will keep exploring Tucson’s inner spaces, and I’ll start bringing my camera along too, just in case I spot some interesting critters. The wildlife here is really exceptional. 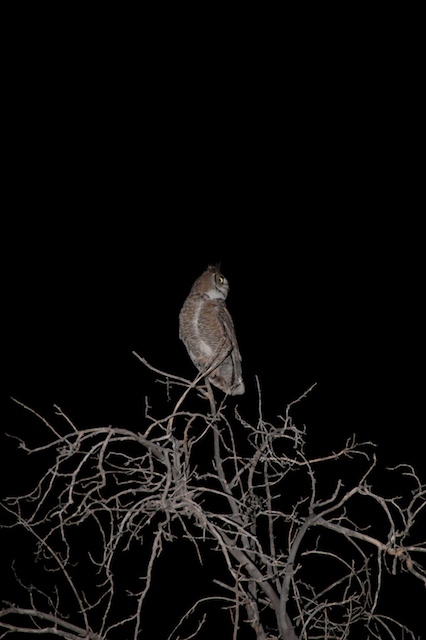 This evening we had a visit from one of the neighborhood’s Great Horned Owls, a creature I have never seen in real life outside of (a) a wildlife sanctuary or zoo; (b) this neighborhood. It’s amazing to me what lives here, and visits regularly. My fervent hope is to encounter some javelinas in a wash somewhere. This environment isn’t for everyone, of course, but it’s fun when someone comes through for a visit and enjoys it enough to take a souvenir. Bruno and Leila, who visited about over a year ago on their annual vacation (from France), wrote today to say that the palm tree seeds Emma gave them survived the trip back to northern France — and now Bruno has palm trees growing in his kitchen on the cold and gray north coast of France. Our neighbor Dottie, sensing perhaps that we were nutty enough to take them, has given us three more palm trees for the back yard. Eleanor and I transplanted them yesterday. Around here, palm trees are practically weeds, but the novelty hasn’t worn off for us yet. It’s all part of the inner space experience, I guess. We have to grow a few palm trees and a saguaro cactus to truly feel and appreciate the sensation of living in southern Arizona. In the spring we may even adopt a desert tortoise and give it sanctuary in our back yard (desert tortoises who have lived in captivity can’t adapt back to the wild, and every year there are always a few who need a new home). Eleanor is planning to put out a hummingbird feeder, too. I guess you could call it “putting down roots,” because we are planting and adopting things around our home base nest, but still we do it with a careful eye to future travel and try to avoid getting into things that would limit our options down the road. Fortunately, desert plants and animals are pretty self-sufficient. It’s a constant battle in my mind between the things that keep us here and the things that send us out on the road. On one hand there are the nesting activities of home and the inner spaces that beg for exploration, and on the other hand there is the call of the unknown and the lure of friends and family scattered across the country. We think we have balance, but I am always questioning it. I suppose that never will end. I’ve been silent this past week (at least on the blog) because I’ve been immersed in a new computer. As you might guess, in my line of work I spend a lot of time punching the keys of my laptop. It’s the most important business tool I have, and every four or five years — just after I’ve gotten the current computer completely tweaked the way I want it — I buy a new one. The new MacBook Pro that I bought to replace it will ease a few technological stresses. For example, my collection of photos (now over 100 gigabytes) had long ago outgrown the computer’s hard drive and was spread out over three external drives. The new computer can easily handle the entire catalog on its internal drive. iPhoto, the Apple “consumer” software I had been using to manage the catalog, is now replaced by the much more capable professional software called Aperture. Now I can manage my entire photo collection and get it organized the way I always wanted it to be. The keyboard on the old Powerbook has been replaced once already, as my constant typing seems to erode the key caps to unreadability. I am hoping the new computer’s keys are more durable, but I’m not very optimistic. The last three computers I have owned have gone to their graves with worn-out keys. Someday perhaps computer designers will come up with a more durable plastic. The old Powerbook has a dent near the power connector (a souvenir of a drop in Tampa’s airport) that makes the connection a little flakey. It is missing one of its four feet, so it wobbles a little in use. Two or three of the case’s screws have worked out and disappeared forever. The computer shows all the signs of a machine that has been in full-time service for years, but it still ticks along just fine, so I’ve dragged my feet on replacing it until last weekend. The new MacBook Pro is a beautiful thing, if you’re the sort that gets misty over computer hardware. I must admit that I am. I’d rather have a slick new laptop than a shiny new car. I spend a lot more time with my laptop than I spend in the car. Actually, I spend more time with my laptop than I do my wife. She’s gone to bed, but me and my digital mistress are still up spending quality time together. So having a computer I can respect in the morning is really important to me, and perhaps that explains why — once every four or five years — I’ll spring for the big bucks required to buy a top-of-the-line Apple Mac. One of the justifications for the upgrade is security. I’ve always been very aware that the loss of my computer could be devastating, so I have long had a program of backups, and secondary backups, in case that should happen. I keep an external hard drive with me when we travel in the Airstream and back up the critical data at least weekly. A secondary backup sits in a fireproof safe in an off-site location. But my old computer was so maxed out on disk space that it was a real challenge keeping all my sensitive data together, and secure. And with the airline travel I’ve been doing lately, I’ve been reminded that there are many ways that I could have a data security problem. Let’s run through a typical scenario, and you’ll see what I mean. I take the laptop on a business trip, and while waiting for my flight, use the free wifi network provided at Tucson International Airport. Anyone can join that wireless network, and with easily obtained software, they can “sniff” the signals my computer is sending across the network. By doing so, they can steal my secret passwords, account numbers, and other information. A hacker can also observe the email messages I send and receive while I’m on that network. Did you know that if you enter the US with a laptop or any other electronic device, the Customs and Border Patrol folks can take it without any justification, examine it, copy the data, and keep it indefinitely? It doesn’t happen often, but I can’t imagine anyone who would be happy about it. Another common situation: What if my computer is lost or stolen while I’m traveling? It is loaded with all kinds of information that I really don’t want other people to have: customer data, financial data, passwords, medical records, personal bills, business plans, etc., plus that wonderful 100-gigabyte photo database. So I’ve been thinking about data security, and reading articles online. It turns out that securing your data is much more complex than it looks. You’ve got to find ways to lock down the data when you’re away from the computer, and when you are transmitting data via the Internet, while keeping the computer usable. There are dozens of ways your data can be compromised, and most people aren’t aware of even the most rudimentary means to protect it. What can be done, and the myriad solutions, could fill a book. I won’t try to explain it all here, but I will mention a few steps I’ve taken (some of these are Mac-specific). First, I’ve encrypted my hard drive. On the Mac, a program called FileVault does the job. If my computer is lost, the data is unreadable without the encryption password. That’s probably the single most important change I’ve been able to make as a result of getting the new computer. Second, I’ve started to use encrypted email services. This is available through Google’s Gmail, Apple’s Mobile Me, and various other services. Encrypted email is protected between my laptop and the mail server, so if anyone is sniffing a wireless network while I’m sending or receiving mail, they won’t be able to make sense of it. But encrypted email services don’t protect mail once it is sent through the Internet, so I’ve also taken the extra-geeky step of obtaining a “personal security certificate” (free through Thawte and others). This allows me to encrypt my email so that only the recipient can decrypt it. The catch here is that I can only send encrypted email to people who also have personal security certificates. I only know one other person in that category, my longtime business associate Brett, but in the future I’m going to require that all employees and contractors who handle sensitive business data, obtain and use a security certificate. Fourth, I’ve fixed my computer so that a login password is always required, even to wake the computer from “sleep” or “screen saver” state. If I walk away from the computer for a few minutes (say, to get a second muffin at Panera Bread), I can easily lock things up and unlock them when I get back, without restarting the computer. I don’t want to have to worry when I’m fetching a cranberry muffin. Fifth, I’ve made my backups more robust. Instead of just copying critical files, I’m using Silverkeeper to make complete “clones” of the computer’s internal hard drive, on external drives. Those clones are complete copies of the hard drive, down to the last bit. If my computer is lost, I can plug the clone drive into any other Macintosh and boot it up just like my original. I’m back in business in seconds. Sixth, I’ve begun using IMAP instead of POP3 for my email. This probably doesn’t mean much to most people, but suffice to say that using IMAP means I can access my email from various devices, send, and trash messages, from almost any device or computer in the world, and when I get back to my laptop everything I’ve done will be perfectly synchronized. This helps if I lose my computer. Before I can get my backup drive hooked up, I can continue to manage messages without dropping a byte. After tweaking everything for a week, I’ve got the computer set up and locked down. It’s not perfect, but it’s light-years ahead of where I was a week ago. I’d still be devastated if the MacBook Pro were stolen or lost, but at least now I won’t be up all night wondering who is looking at my data. I’ll just be wondering what I’m going to do for a new digital mistress.